Recording a self-tape audition is a new trend in the acting industry where casting directors request actors to record themselves reading a sample of a script and then submit the self-taped video as their audition. Taking a self-taped audition is very similar to taking a headshot for your application, it’s all about making that great first impression whilst not actually being present like you would in a live audition. A huge advantage of a self-tape video is that the casting director can get a better sense of your movements, expressions and style. It is important that the casting director is able to see and hear you clearly, with no background disturbances or display issues. Physical auditions and castings cost time and money for everyone involved. Actors have to pay travel expenses and casting directors use valuable time and money arranging audition space and recording facilities. Self Tape auditions allow actors to audition for roles from the comfort of their home 24x7. By seeing an actor on camera, reading a line of the script, Casting Directors and Employers are able to get a better impression of how suitable an actor is for the role before they invite them in for a face-to-face audition. How does it work on The Mandy Network? When posting a casting, employers can now request the self-tape feature on Mandy. Any job where self-tape is required, you will see our self-tape logo. The employer will provide sides or a script that they want actors to record via a self-tape audition. This is included with the character details. Using your mobile phone camera, desktop or laptop computer you can now record a Self Tape audition. Play it back, save, delete and try again. In fact, you can record your audition as many times as you like until you are satisfied that you have it right! Apply for Self Tape jobs using our new built in video recording service. Auditions are clearly marked on the acting jobs in the UK section with the little Self Tape icon. Receive high quality video submissions for your castings. Only see the professional actors who fit your breakdown. Review video submissions in minutes! Make sure you have the best lighting for your self-tape audition by setting yourself up in a room that allows enough light so you can be seen but not too much that it creates a glare on your screen. Avoid the unflattering overhead light by sitting closer to a window where you can have the benefits of natural light, and place a warming lamp near you, as it creates a softer tone and eliminates dark shadows, resulting in your being gently highlighted. As tempting as it is to create an impressive background, it is important not to waste any time on doing so, the only thing the casting director will be looking at is your performance. Your frame should be set up before filming and then not touched again, your frame should be medium to close focusing on your head and shoulders. The most effective self-tape background is as simple as a white sheet, that way they aren’t any cluttered distractions in the background. What do I wear in my self-tape? Naturally, people’s eyes are drawn to the lightest part of an image, and the same counts for a video. You want the casting director to focus on your face and more specifically your eyes, so try to avoid a bright white outfit, but similarly, avoid a black outfit that creates a ‘floating head’. It’s important to find the perfect balance, but at all costs avoid patterns and branded logos. Shooting a self-tape is no different to a live audition, think of your camera as the casting director and panel… avoid making eye contact with the lens. Look forward to an object just beyond the camera or even place a sticker just to the left of the video recorder so your focus is slightly set to onside. 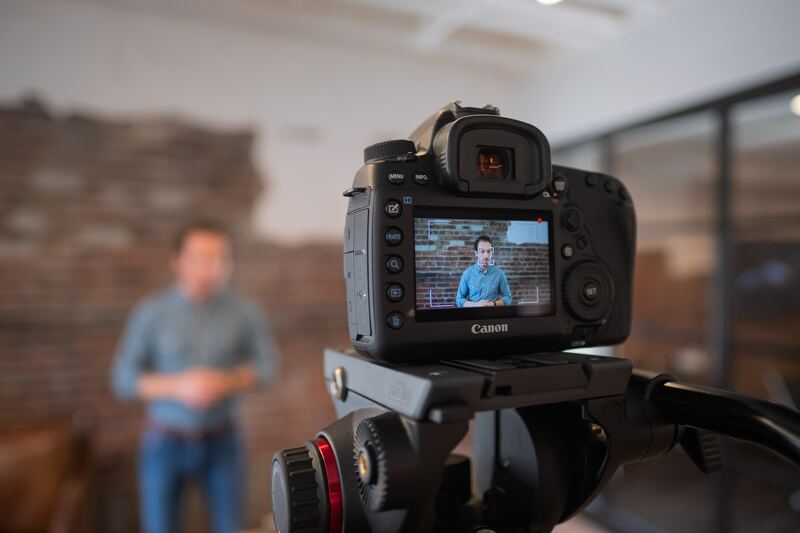 Practising several takes of your self-tape is so important, that way you can look back at the 6 important elements of creating a successful self-tape listed above before sending it off. Carefully make notes on what went well and the improvements you could make regarding lighting, setting, sound, focus, whether you’re inside the frame, how impactful your outfit is and most importantly, whether your performance and back and forth with your reader is as smooth and as great as it could be. Have you found a job with us here at The Mandy Network and it requires a self-tape? Read our handy guides: Self-Taping for Actors and Employers to get some more advice.